Come join us at our First Anual Fundraiser! The Margarita Muñiz Academy is the first dual language high school and an Innovation School of the Boston Public Schools. Muñiz Academy opened September, 2012! We are located at 20 Child Street in Jamaica Plain. Muñiz Academy is dedicated to preparing citizens and leaders who are fluent in English and Spanish. Every student will be ready for college and will contribute to the community and beyond. Muñiz Academy partners with families and community to realize our mission together. Muñiz Academy in the News…. Join us! Continue in English. Dr. Chang visita la Academia Muñiz. 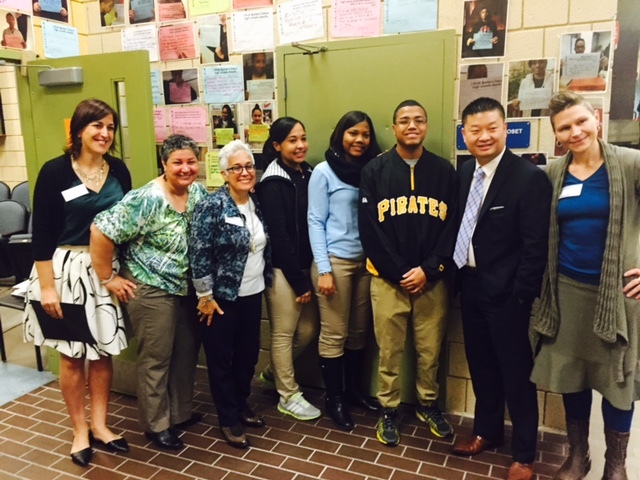 Dr. Chang visits Muñiz Academy. Academia Margarita Muñiz es la primera escuela secundaria bilingüe (grados 9-12) en las Escuelas Públicas de Boston y también fue creada como una Escuela Innovadora. ¡Academia Muñiz abrió sus puertas este septiembre del 2012! La Academia es ubicada en20 Child Street de Jamaica Plain. La Academia Margarita Muñiz se dedica a preparar cuidadanos y líderes que son bilingües en español e inglés. Los alumnos de MMA estarán preparados para la universidad y listos para contribuir en la comunidad. Junto con nuestras familias y la comunidad, alcanzaremos nuestra misión. This is going to be a great school. This School Is The best im in middle school and my first choice is margarita muniz academy. This school is great because I’m learning a lot !!!!!!!!!!!!! Es un orgullo pertenecer a esta gran Familia, la promesa del futuro nos espera!!!! 2nd year at MMA and its just GREAT!!! teachers are very cooapertive and are there for you if needed to stay after school. I struggled for 4 years but thanks to all the teachers I stand where I stand today. Orgulloso de ser parte de la comunidad y la clase del 2016.